I am Dale Hayter, a Microsoft and VMware certified Technical Consultant. My blog has been built up over the years from my experience of working on an IT helpdesk and also from being out on-site. I tried creating a new mail profile and even a new windows profile and it still didn’t work. The user could log into OWA fine. 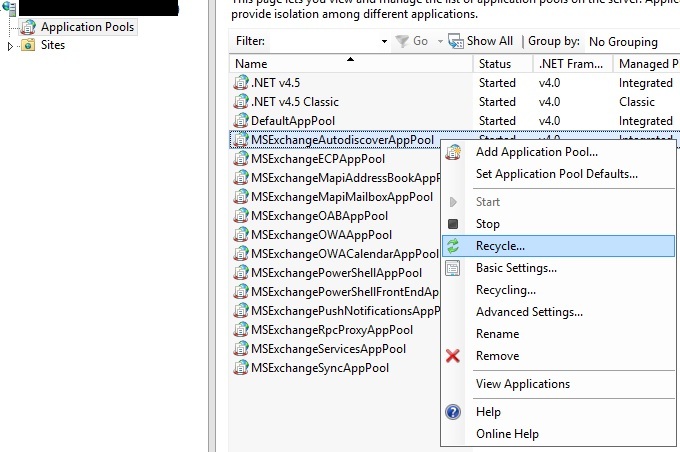 To resolve the issue I logged into the Exchange 2013 Mailbox server and recycled the application pool for MSExchangeAutoDiscoverAppPool and MS ExchangeRpcProxyAppPool. When the RPC app pool was recycled the user was fine. However leave it 5 minutes and it stopped working again. I then created a unlimited throttling policy and applied it to the user. This then permanently resolved it. Then last but not least assign the policy to the user.